Someone has decorated a small tree in Comstock Park. That's where I walk my dog, Ben, almost every morning. My dog-walking friends, The Amazing M's, and I discovered it December 21, the shortest (and darkest) day of the year. 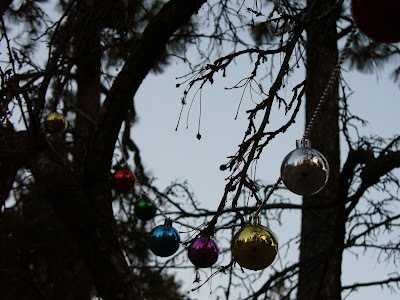 The dark, stark background of the city park in December accentuates the tree's quirky simplicity. A few strands of beads and Christmas ornaments. Christmas chains made of out of aluminum foil. One frosty (real) pine cone suspended from a string on a skinny, calloused branch. And, at the bottom of the tree, a small plastic snowman stuck in the ground on a stake. We stopped dead in our tracks when we saw the tree for the first time, faintly shimmering just south of the baseball field at the upper end of the park. It was so out of context, and yet so perfect. None of us could ever recall a Christmas tree in Comstock Park. We walked up to the tree and stared, admiring its humble trimmings. Speculating about who might do such a wonderfully whimsical thing. Our dogs, Ben and Wally, seemed to sense that something unexpected and oddly lovely had happened in their park. Two days later, the tree is still decorated, unsullied by Comstock's dog walkers, joggers and occasional grafitti artist. I smile when I walk by it. I think we all do. I can't speak for others who visit Comstock each morning, but "our tree" reminds me to slow down and appreciate the fact that it doesn't take much to generate holiday cheer. It can be as simple as a Christmas tree in Comstock Park. God rest ye, merry tree-trimmer(s). Whoever you are.